Under New Jersey business law, when two or more parties enter into a contract they are essentially writing their own law which will govern their relationship. 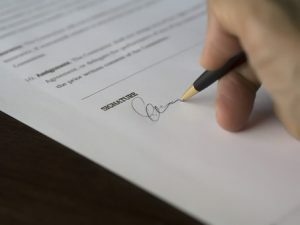 A valid contract – one where each of the parties exchange value (“consideration”) and agree to the terms which will govern their relationship or transaction – will be enforced by courts. If there is a dispute, a court will make a decision which can be fully enforced. Much of contract law has been developed through the “common law.” The common law is based on the decisions which courts have made in the face of problems encountered in real world contract law disputes. The common law provides many remedies when one party breaches the terms of the contract and causes the other party to suffer damages. (1) to allow the inclusion of additional terms and conditions not expressly set forth in the contract, but consistent with the parties’ contractual expectations; (2) to allow redress for a contracting party’s bad-faith performance of an agreement, when it is a pretext for the exercise of a contractual right to terminate, even where the defendant has not breached any express term; and (3) to rectify a party’s unfair exercise of discretion regarding its contract performance. What does this mean for parties in a business relationship governed by a contract? The most important thing is to get a well-written contract which says what you want it to say, and protects you if a dispute arises, as they sometimes do. Our business attorneys have found that a well-written contract is invaluable for many reasons, but two are of paramount importance. First, a well-written contract will avoid disputes. If the terms which set out each party’s rights and responsibilities are clearly defined, then disputes are usually avoided and the parties can have a productive, mutually profitable relationship. Second, if disputes do occur – and sometimes no matter how well-drafted the contract, a party will just pick the wrong dance partner – the contract will provide remedies to protect the innocent party’s rights. However, when you are a party to a contract, you have to do more than just follow the straight letter of the law. You have to work with the other side to make the relationship work the way it was intended. Sometimes this doesn’t work – sometimes business plans just go south, and sometimes people just choose the wrong partners. However, you have to work with the other side so that they can get every opportunity to make it work. This is important to comply with New Jersey’s covenant of good faith and fair dealing. It is also important even when the covenant is not implicated. Our business lawyers have found again and again that when there is a dispute over a purported breach of contract, evidence that you worked with the other side to make the relationship work will go a long way to convince a judge or a jury that you were acting in good faith, and that it was truly the other side which committed the breach – in other words a paper trail which shows that you were trying to live up to the covenant will make you look like the “good guy” who the judge or jury wants to help find a way to win, and the other party is the “bad guy,” who the judge or jury wants to lose. If you have any contract or business law issues, call (973) 890-0004 or email us to set up an appointment to speak with one of our business attorneys. We can help.